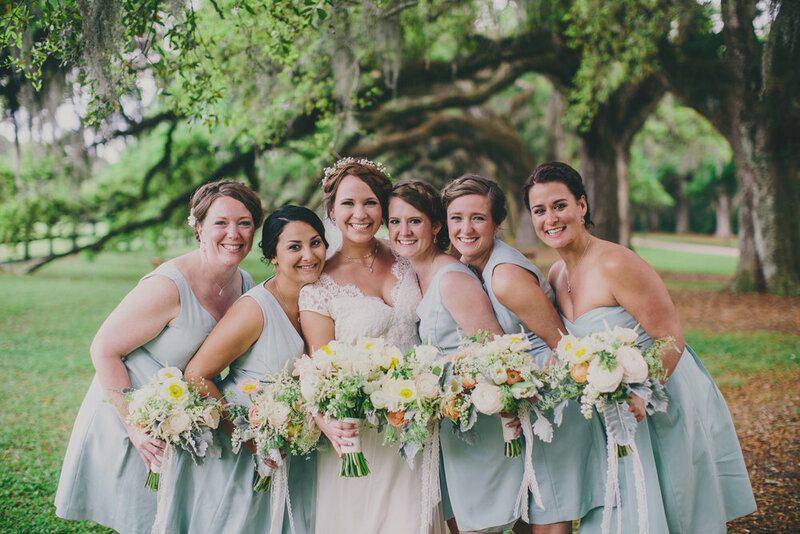 We still can't get enough of Megan + Blake's rustic chic Boone Hall Wedding at the Cotton Dock! This wedding was full of thoughtful details that made for a beautiful night to remember! The day began with hair and makeup for Megan and the girls by Paper Dolls on Isle of Palms, while Blake and the boys suited up at Wild Dunes. Everyone met at Boone Hall Plantation for the bride + groom's long-awaited first look! With the combination of this couple's style + the natural beauty of the plantation grounds, these pictures came out utterly perfect. When it came time for the ceremony, dark skies were on the horizon, but Pure Luxe Bride quickly rocked the rain plan and held a standing ceremony for guests on the dock under the overhang. Wine barrel cocktail tables served as impromptu aisle markers and the lounge furniture was used to seat the immediate family of the bride + groom. The bride was a vision of elegance as she walked down the aisle to an instrumental version of "Something in the Way She Moves" by James Taylor. Her organic bouquet by Branch was blooming with white astilbe, white ranunculus, white sweet peas, dusty miller leaves, Queen Anne's lace, pale yellow poppies, soft blush ranunculus, and more, tied together with an ivory lace ribbon. Megan also wore a flower crown with loose stems of baby's breath, spirea, and white majolica spray roses. Post-nuptials, cocktail hour kicked off with the wedding's signature drink, local Firefly sweet tea vodka + lemonade in a mason jar, and passed hors d'oeuvres by Cru Catering. Guests then made their way to their seats at dark-wood farm tables decorated with white lace runners, wooden boxes filled with a spilling arrangement of soft yellow ranunculus, white lilac, apricot parrot tulips, and more, vintage blue mason jars filled with candles, and milk glass bud vases with peachy blush sweet peas. Vintage books with hand-painted gold numbers served as the table markers and mahogany stained wooden wine crates filled with sheet moss and queen annes lace housed the guest's place cards. A mouth-watering plated dinner was served to guests while Megan's matron of honor gave a heartfelt speech to the newlyweds. After dinner, it was time to cut the three-tiered cake by Sablee made up of champagne cake with wild strawberry and champagne filling, coconut cake with coconut cream filling, and vanilla cake with vanilla buttercream filling. Guests enjoyed cake and mingling while dancing to the sounds of Epic Charleston all night long! A few of our other favorite details from this elegant reception included the chandelier above the dance floor covered in a lush, organic arrangement of flowers and the vintage, distressed mirrors hanging on one of the back walls. As the night came to an end, the new Mr. + Mrs. danced to "Is This Love" by Bob Marley before happily departing through a sparkler archway! Thanks so much to Hyer Images for capturing this gorgeous wedding! The rain did not stop Liz + Greg's wedding at Boone Hall Plantation from being anything short of perfect. The bright and cheery-colored flowers throughout the Cotton Dock gave an extra pop of color to this rustic space. Two mason jar chandeliers hung between the main doorways and were complimented by gorgeous light pink and yellow peonies along with candles to complete this southern romantic look. Liz + Greg's head table was lined with a detailed floral runner, along with cotton strings draped along the wall behind them. The bride + groom began their festivities by having their "first look" beneath a tall, Southern Oak. Despite the heat, the guests arrived to Boone Hall and were greeted with adorably petite paper fans as they took their seats for the ceremony overlooking the water. Pleasantly complimented by light yellow, pink, and warm gray accent pieces, Liz + Greg said their "I do's" on the Cotton Dock at Boone Hall Plantation, with an absolutely stunning marsh backdrop. Following the ceremony, the guests enjoyed a fabulous cocktail hour in front of the classic home, which was accompanied by large Oaks and an array of flowers in bloom. Once Cocktail Hour was over, guests headed back to the Cotton Dock for dinner, where Liz + Greg were introduced for their first dance as husband and wife. The sweets table had everyone's mouth watering, complete with peach toppers on their cake and mini desserts by Wild Flour Pastry's. As the vintage limousine arrived to pick up Liz + Greg for the evening, their guests said goodbye with a fun-filled sparkler departure! Thank you to all of the fabulous vendors who assisted in Liz + Greg's wedding! Hair and Makeup | Ash & Co.
We're in love with these gorgeous pictures captured by Reese Moore Photography from Sarah + Justin's Boone Hall Plantation wedding this past February! The couple wed in a romantic ceremony held at the Mt. Pleasant Presbyterian Church. Sarah walked down the aisle in a dazzling white, timeless gown, matched with effortlessly romantic hair and make-up by Posh Salon. After saying their I do's, the newlyweds joined their guests in a fabulous feast at the beautiful, rustic Boone Hall Plantation. The crowd celebrated with amazing tapas style comfort foods from B. Gourmet Catering and with 80's era tunes performed by the Suicide Blonde Band. Fun 80's themed details included glow-sticks, wayfarer style sunglasses, snap bracelets which reflected the relaxed and playful personalities of the duo perfectly. Eventhough the rain poured and the sun refused to shine, the smiles on the couples' faces were enough to light up the whole day! Pure Luxe Bride loved planning and designing this Boone Hall Plantation Wedding.